Bangor on Dee’s Harry Morgan had a disappointing Woodpecker Stages rally when a broken clutch forced him out of the event on the third stage. The event was round 7 of the BTRDA Rally First championship and Morgan had been hoping to build on the third place he held on the RF1.0 leaderboard. Morgan and co-driver James Ford already faced problems before the rally started when the fuel pipe burst on the night before the event. Fortunately a replacement was sourced and the pairing were able to make the start. 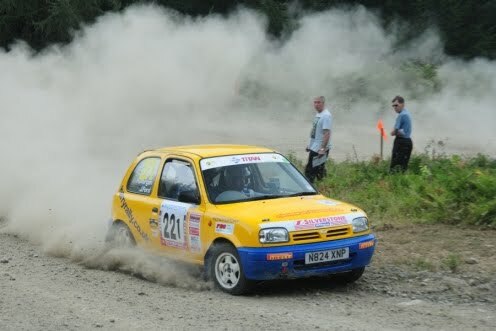 The Micra crew made a rapid start to the Ludlow-based event, setting second fastest time in the class on the opening High Vinnalls. Stage two, Hazel Coppice, did not go so well with a big spin and several near overshoots as Morgan battled to stay near the top of the leaderboard. Morgan’s hopes of a good result ended in the Cwm y Gerwyn stage which was held in Radnor forest. Part way through the stage on a fast downhill section the car slid into a ditch. Although he was able to get the car out eventually the clutch had been put under too much strain and it failed on the next corner, putting Morgan out of the event. The retirement means that Morgan drops to fourth place in the RF1.0 championship although he still lies in second place in the Junior drivers’ championship. Please visit www.harryrally.co.uk for more information on Harry Morgan’s rallying.